Custom upholstery options available. 7 yards of fabric required. Custom made proudly in the USA. Please allow 8-10 weeks for production. A 50% deposit is required. All custom orders are final sale. 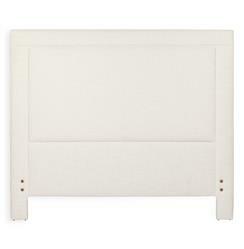 We spend a ridiculous amount of life in bed and a great headboard effect can effectively make a bedroom. With custom fabric options available (we love the ivory linen the Sloan is shown in), this lightly padded headboard can easily be one of those room-making pieces. Headboard supports 10 in. bed frame only. Available in King, Queen, and Twin sizes. Custom made proudly in America, please allow 8-10 weeks for production.